I'm wondering about the technique used when sampling a layered material for the next event in a path tracer. I have a material with three layers: a base diffuse, specular and sheen lobes. How does one go about choosing a discrete layer to sample for the next ray direction? Is this just a random selection? If so, are equal weights assigned to the layers or are weights used based on final contribution of a lobe? Thanks for any insight into this stage of sampling. As Alan has already said, following the actual path of the light ray through each layer leads to more physically accurate results. I will base my answer on a paper by Andrea Weidlich and Alexander Wilkie ("Arbitrarily Layered Micro-Facet Surfaces") that I have read and partially implemented. In their paper they assume that the distance between two layers is smaller than the radius of a differential area element. This simplifies the implementation because we do not have to calculate intersection points separately for each layer, actually we assume that the intersection points are the same for all layers. According to the paper, two problems must be solved in order to render multilayered material. The first one is to properly sample the layers and the second is to find the resulting BSDF generated by the combination of the multiple BSDFs that are found along the sampling path. UPDATE: Actually I have adopted a different method to implement the evaluation of this layered model. While I have kept the idea of considering the intersection points to be just the same point along the layers, I have computed the sampling and the final BRDF differently: for sampling, I have used ordinary ray tracing, but through the layers (using Russian Roulette to select between reflection/refraction when that's the case); for the final BRDF evaluation, I just multiply each BRDF traversed by the ray path (weighting the incident radiances according to the cosine of the incident ray). 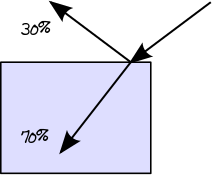 As can be seen, TIR or Fresnel reflectance might keep some rays bouncing indefinitely among layers. As far as I know, Mitsuba implements plastic as a two layer material, and it uses a closed form solution for this specific case that accounts for an infinity number of light bounces among layers. However, Mitsuba also allows for the creation of multilayer materials with an arbitrary number of layers, in which case it imposes a maximum number of internal bounces since no closed form solution seems to exist for the general case. As a side effect, some energy can be lost in the rendering process, making the material look darker than it should be. In my current multilayer material implementation I allow for an arbitrary number of internal bounces at the cost of longer rendering times (well... actually, I've implemented only two layers.. one dielectric and one diffuse :). An additional option is to mix branching and RR. For instance, the initial rays (lower deep levels) might present substantial contribution to the final image. Thus, one might choose to branch only at the first one or two intersections, using only RR afterwards. This is the case with smallpt. 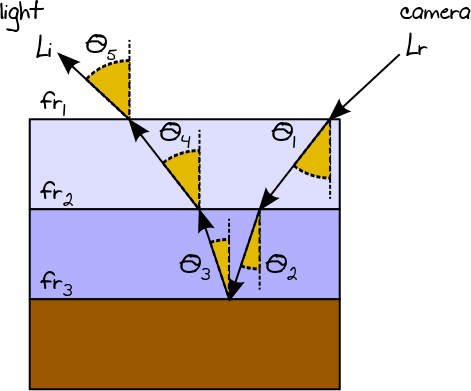 An interesting point regarding multilayered materials is that individual reflected/transmitted rays can be importance sampled according to the corresponding BRDFs/BTDFs of the current layer. The paper by Andrea Weidlich and Alexander Wilkie also takes absorption into consideration, i.e. 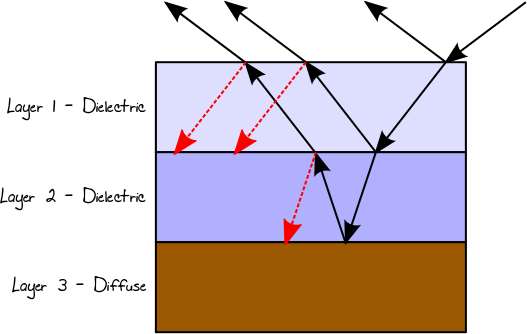 each light ray might be attenuated according to the absorption factor of each transmissive layer and to the distance traveled by the ray within the layer. I've not included absorption into my renderer yet, but it is just a real coefficient computed according to the Beer's Law. The Mitsuba renderer uses an alternate representation for multilayered material based on the "tabulation of reflectance functions in a Fourier basis". I have not yet dig into it, but might be of interest: "A Comprehensive Framework for Rendering Layered Materials" by Wenzel Jacob et al. There is also an expanded version of this paper. Thinking about it from a physical standpoint, it seems that it would work like a generalized version of diffuse / specular calculation. You'd start with the top most layer and use fresnel etc to calculate a percentage of light that reflects vs transmits. You then use a random number to determine which of these to do for your sample. In the case of reflection, you'd do the specular lobe of your top most layer, reflect off the surface and move on. In the case of transmission, you'd move to the 2nd layer. At this layer, you'd once again calculate the percentage chance to reflect vs transmit. In the case of reflection, you'd use the specular lobe of this second layer, do the reflection and move on. In the case of transmission, you'd move to the inner layer. For this inner most layer you'd once again figure out if you needed to reflect or transmit. For reflection you'd use this inner layer's specular lobe. For transmission, you'd do your diffuse calculation, or whatever else your inner most surface wants to do for transmitted light (sub surface scattering? refraction? etc). I'm uncertain if each layer should do it's own refraction and if technically you should move the ray a tiny bit between layers to get more realistic effects. For your case it may not make a difference. But basically, if you had a sphere with 3 layers on it, it SHOULD behave as if you had 3 different spheres nested in one another that each had a single layer that handled transmission vs reflection. Having a layered material is just a more compact way of saying that this is what you want, compared to having the three separate objects.